A very rare brown wax operatic cylinder from the obscure French Le Cahit phonograph company. Announcement "Les Noces de Jeannette - Enfin, me voilà seul, chante par Monsieur Aumonier, procede Le Cahit." The popular turn-of-the-previous-century French bass, Paul Aumonier, sings Enfin, me voilà seul ("Finally, here I am alone") from scene I of Victor Massé's 1853 one-act comic opera Les Noces de Jeannette ("The Marriage of Jeanette") on a very rare Le Cahit brown wax cylinder. These extremely scarce late brown wax era "process Cahit" records came packaged in a particularly handsome & colorful cylinder carton (see below). For more information on Cahit, see phonograph expert René Rondeau's article (courtesy of his online Antique Phonograph Museum). Other than the above, I know little about Le Cahit cylinders (I'm estimating this recording is circa 1904), and any additional information would be greatly appreciated. Many thanks to Greg Thymius and David Winter for their assistance translating the announcement. 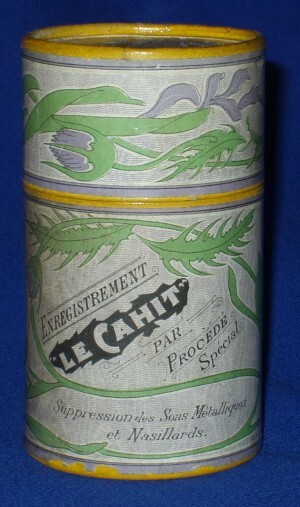 Le Cahit cylinder carton front. 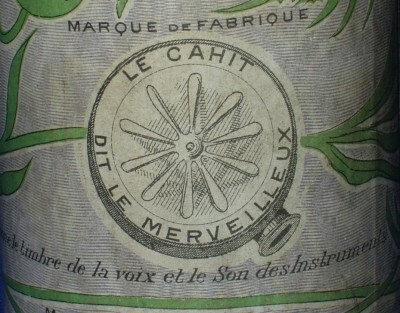 Close-up Le Cahit cylinder carton back, illustrating Cahit's Bettini-style reproducer.